There are several ways to do that. 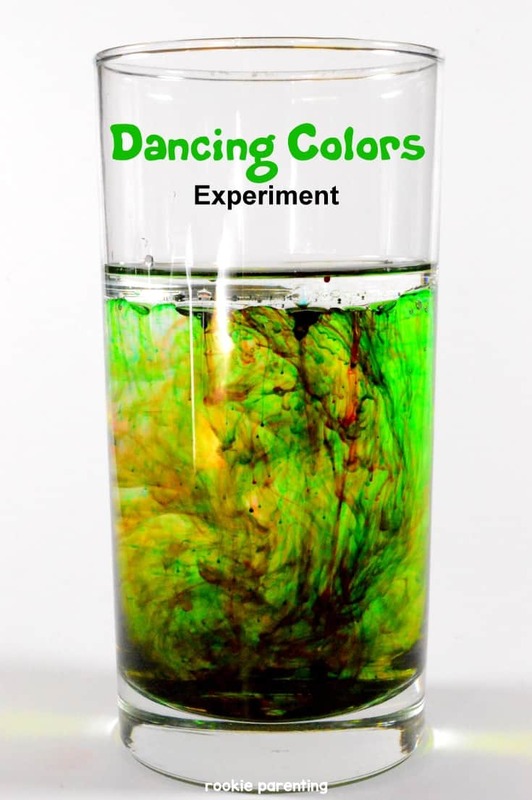 In this experiment, which my kid preferred calling it “fireworks” or “falling rainbow” in a glass, you can watch color dance gracefully in the water. 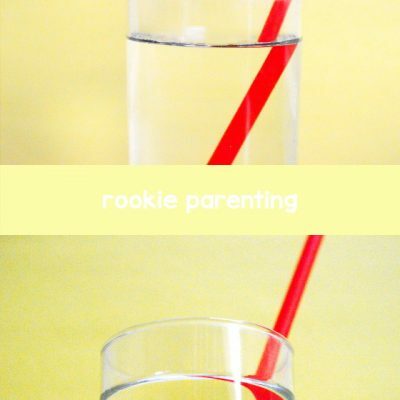 Fill one glass with water to 3/4 full. Pour baby oil into another glass to about half an inch high. In the baby oil, add food coloring of different colors. 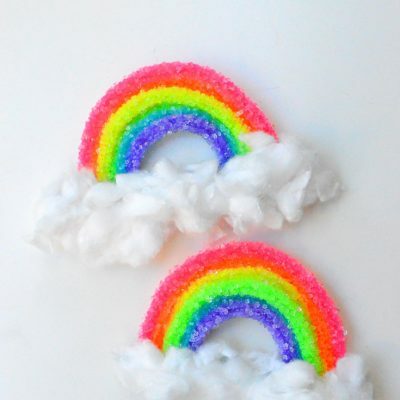 Using a stirrer, break the food coloring into tiny droplets, but do not mix the colors unless you want a dancing mixed color. When it finishes, if you want to do the experiment again, you can try to use a single color or different amounts of colors. There are several scientific observations you can make in this experiment (and show your preschoolers). First, baby oil and water don’t mix. As you pour the oil into the water, you can see it sink into the water due to gravity and momentum. But instead of mixing into the water, the oil forms a bubble and the bubble eventually floats back to the surface. These two fluids don’t mix because oil is made up of non-polar molecules while water highly polar molecules. Oil is said to be insoluble in water. 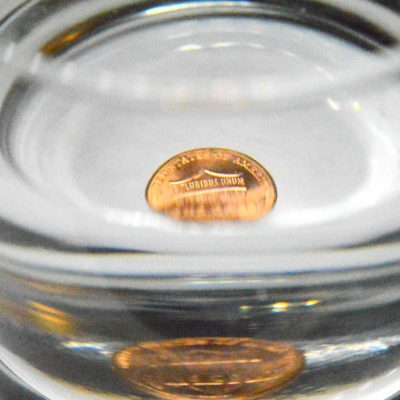 Second, the baby oil floats to the surface because of the difference in densities. Oil has a lower density than water. Lower density fluid floats on top of higher density fluid. On the other hand, food coloring has a higher density than oil. So when the oil/coloring mixture is poured into the water, the coloring stays up inside the oil for a little while. 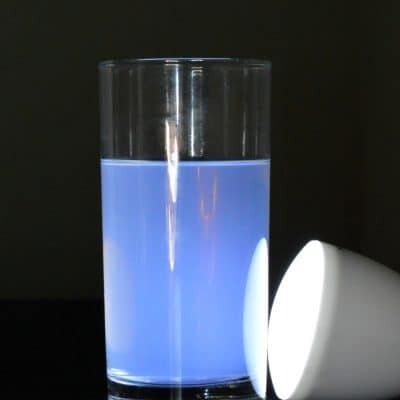 Eventually, it sinks below the oil and dissolves in the water because unlike oil, food coloring is soluble. Now comes the dancing. What is it? 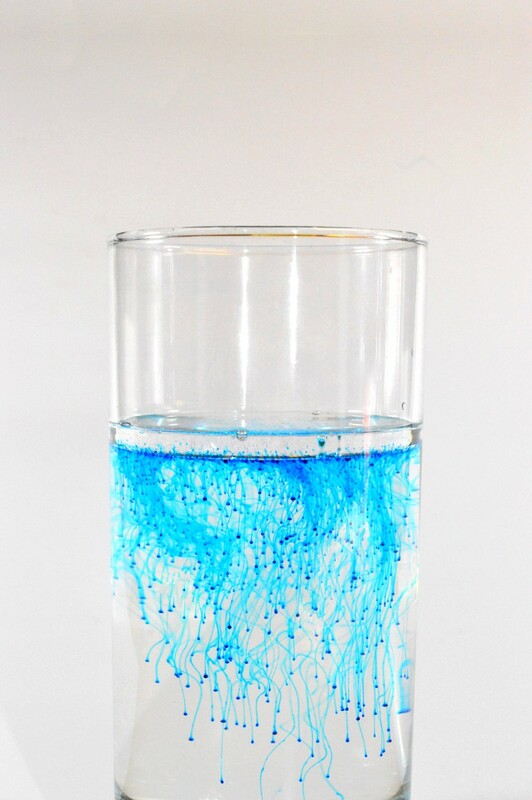 The food coloring and the water are going through a process called diffusion – movement of molecules from a region of high concentration to a region of low concentration. The concentration of the coloring is highest near the oil layer. The coloring’s molecules randomly move towards the bottom where the concentration of the coloring is the lowest. Because the molecules move somewhat randomly (with gravity pulling them downward), they leave behind trails of color as they diffuse. Given enough time, the food coloring will mix thoroughly with the water evenly.